I used www.random.org to pick the winners. You both are are giveaway winners! Please contact Shaylyn of Bright & Bold Designs to claim your prize. Looking forward to hosting another giveaway soon! I am thrilled to be hosting my first official giveaway!!! This particular one really excites me! 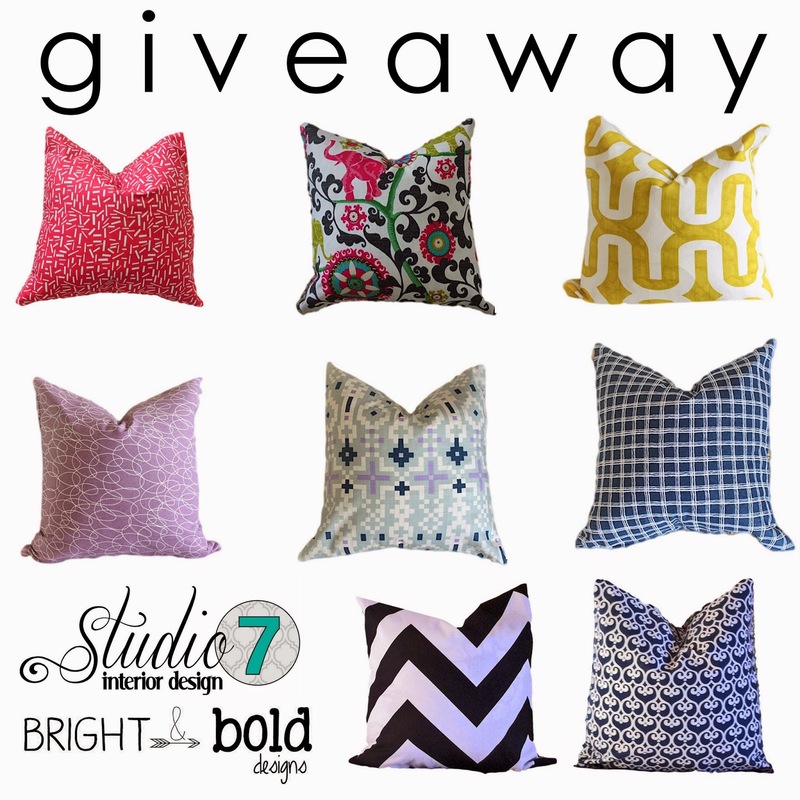 As you can tell, the giveaway is for these darling pillow covers! But here is the exciting part... its for not just one 18x18 pillow cover, but for TWO! You have the chance to win one for you & a friend! Cute Shalyn over at Bright & Bold Designs contacted me about hosting and I couldn't wait. 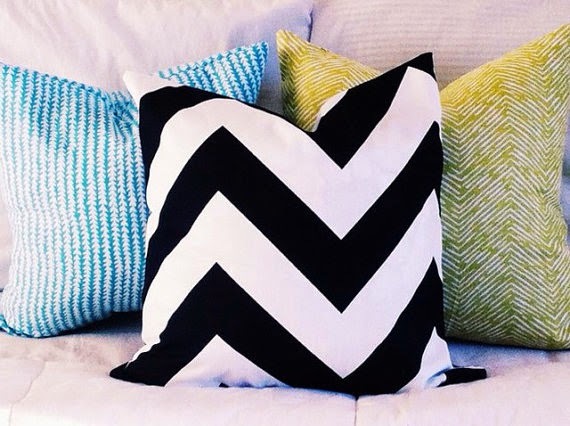 Most people who know me know how much I live for cute pillows, and especially how much I drool over bold graphics and bright colors. Bright & Bold Designs delivers! And, here's the icing on the cake... they are budget friendly! Shalyn was also sweet enough to give my reader's a 10% off code good through Friday. Be sure to check out her shop and order one or two, you know you want to! 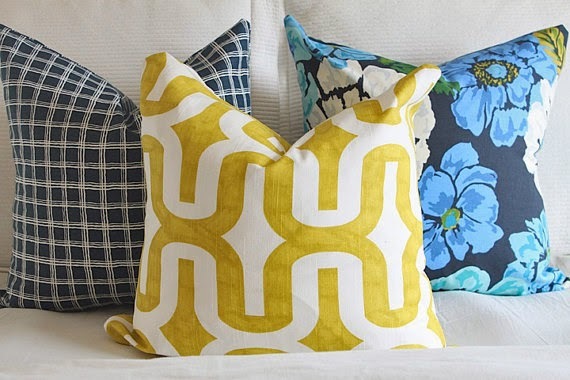 1) Visit Bright & Bold Designs Shop and take a looksie at the pillows. Then leave a comment on this post with which cover you would love to win. 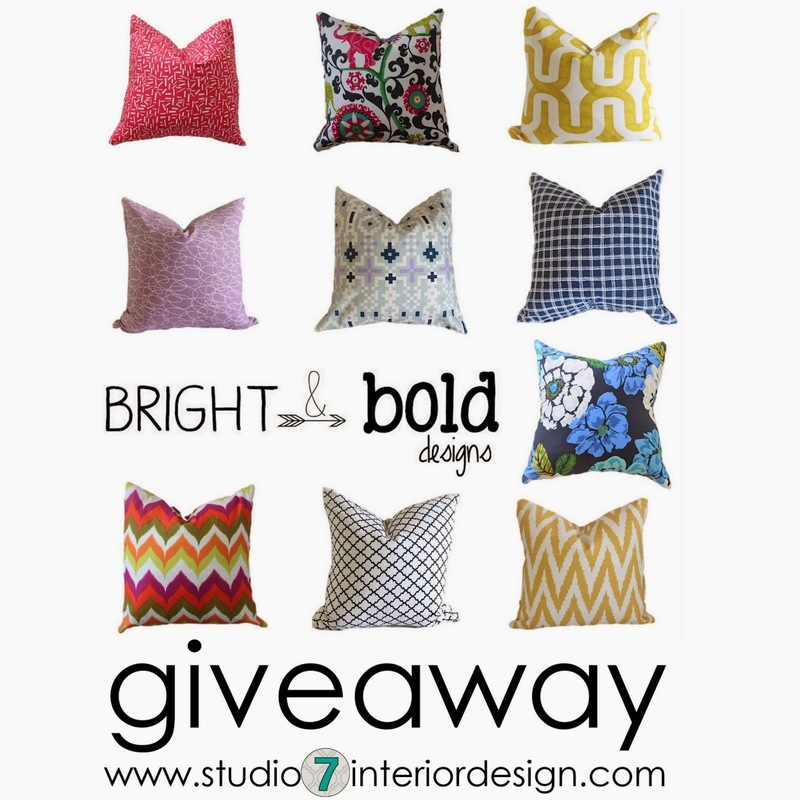 2) Visit Studio 7's Instagram page, follow both mine & Bright & Bold Designs accounts, then find the giveaway post and tag 5 friends who you would want to win a pillow cover. Each tag will give you one entry. But only those who follow will be eligible to win. So you can earn up to 6 entries! The Giveaway will close on Friday, March 28th and will be announced by 9pm MST. I had such a fun time working on this project! 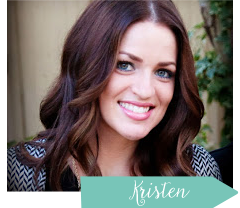 My cute client/friend is a very talented photographer and she writes for the popular blog 'Click it up a Notch.' 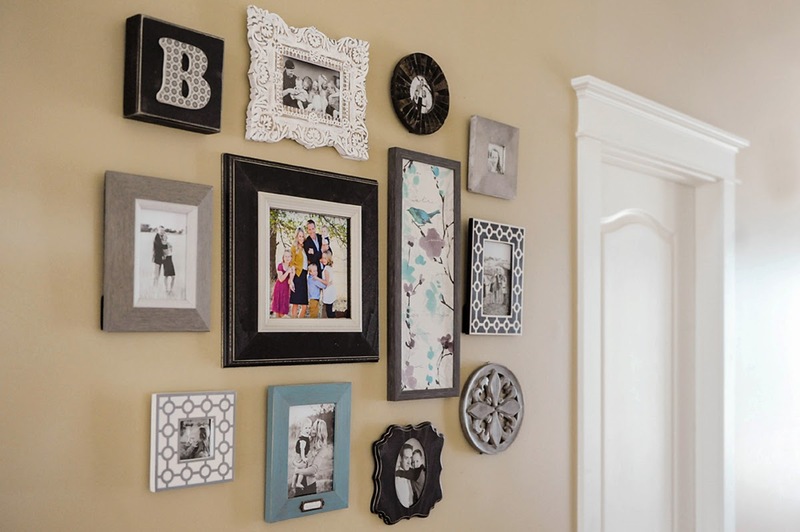 She asked for my help in styling her entry way for her blog post, 7 tips for choosing which images to print for your home. It was a great article, so be sure to check it out! 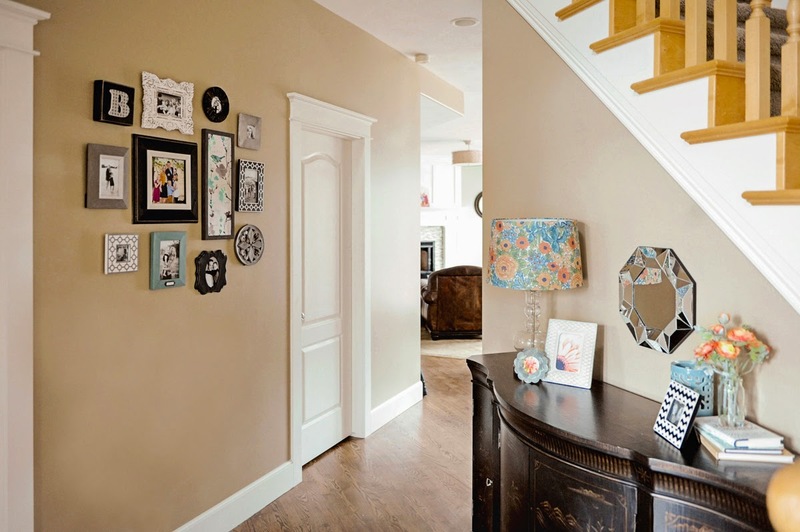 The only thing she knew she had to have was a gallery wall to display her photography opposite this black credenza in her foyer. I made sure to pick a few black frames to balance out the heaviness of this furniture piece. Adding in these current colors and graphics gives this other wise traditional piece the updated, trendy look my client was after. I love how it turned out! 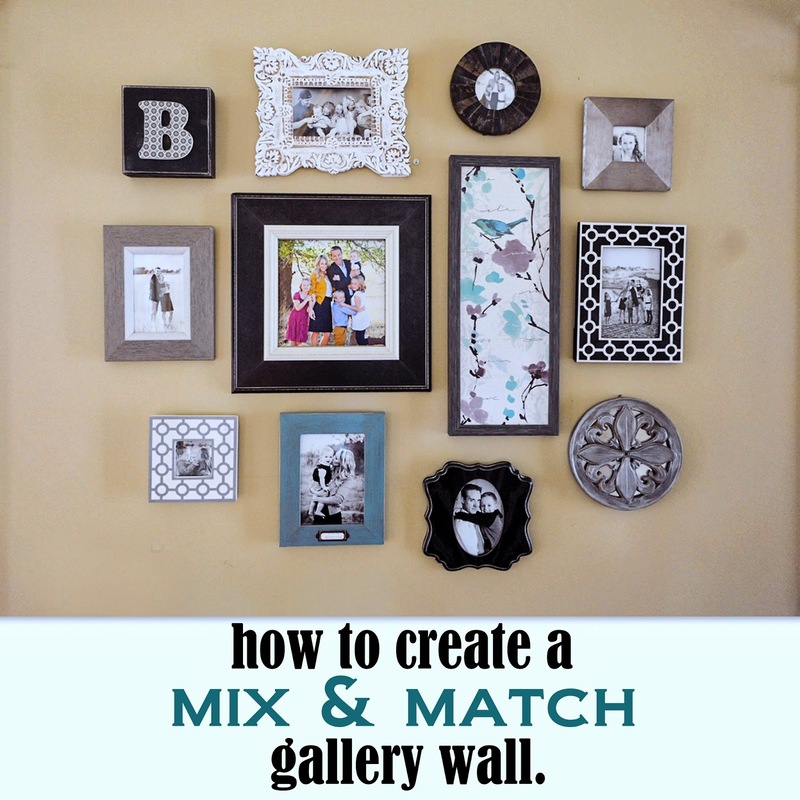 Creating a mix & match gallery wall like this one is a lot of fun! 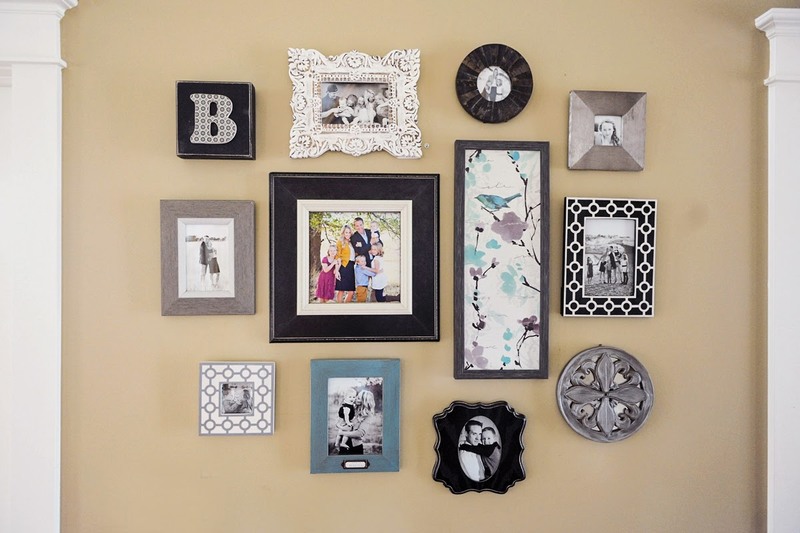 I always have one or two larger frames to anchor the center and to have the eye immediately go to. Then I will create a circle of frames around the center piece. It doesn't have to be perfectly symmetrical, just let your self have some fun with it! I buy a bunch of frames and bring them to the space and play around for a bit. More times than not I will end up taking a few frames back, but to be safe get a few more than you think you will need. Be sure to try and balance out colors and shapes also. A trick I use to make sure it's balanced is taking pictures to see how it looks on camera. That always does the trick in really knowing how it looks. The good thing about a project like this is there is no wrong answer! 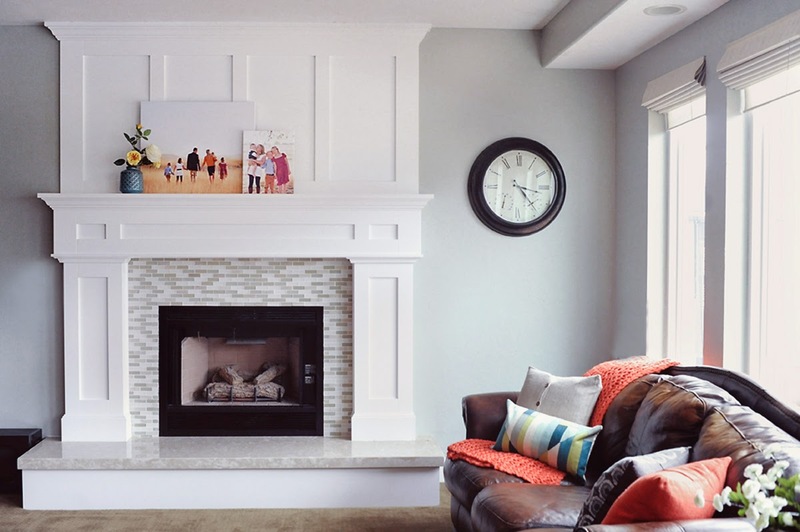 We decided on the color scheme from the family room that is just around the corner from the foyer. 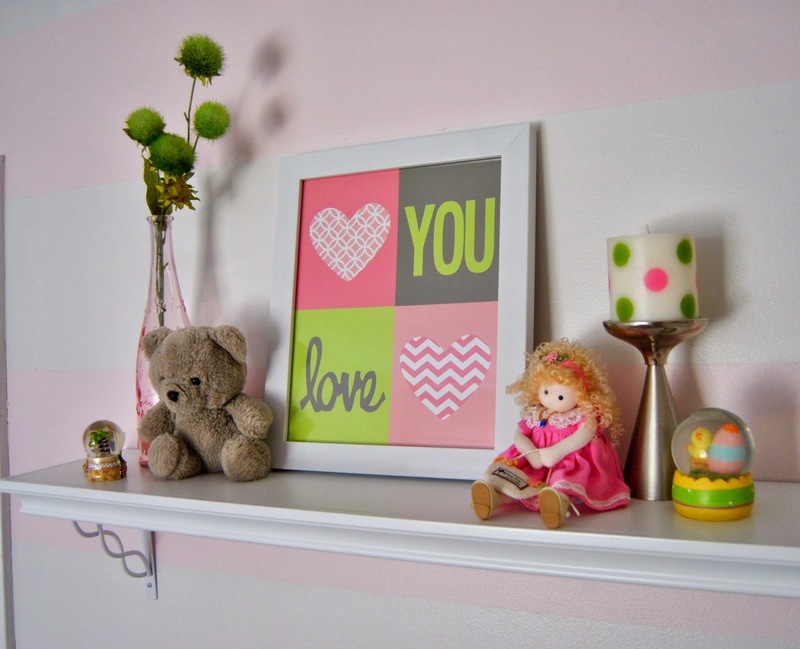 Here is a sneak peak of this room we are decorating. Just waiting on a few pieces to arrive to finish it! 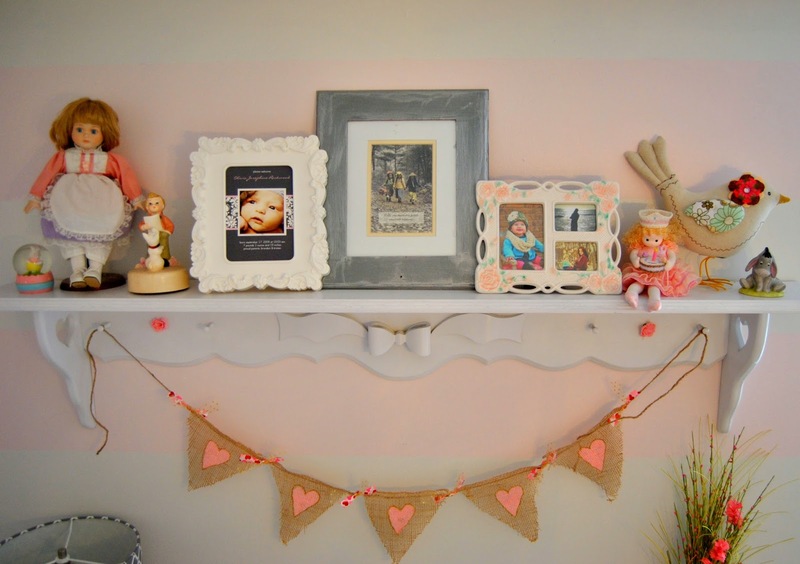 And check out this mantel! My friend's husband did all the handy work on this beauty! Absolute PERFECTION!!! 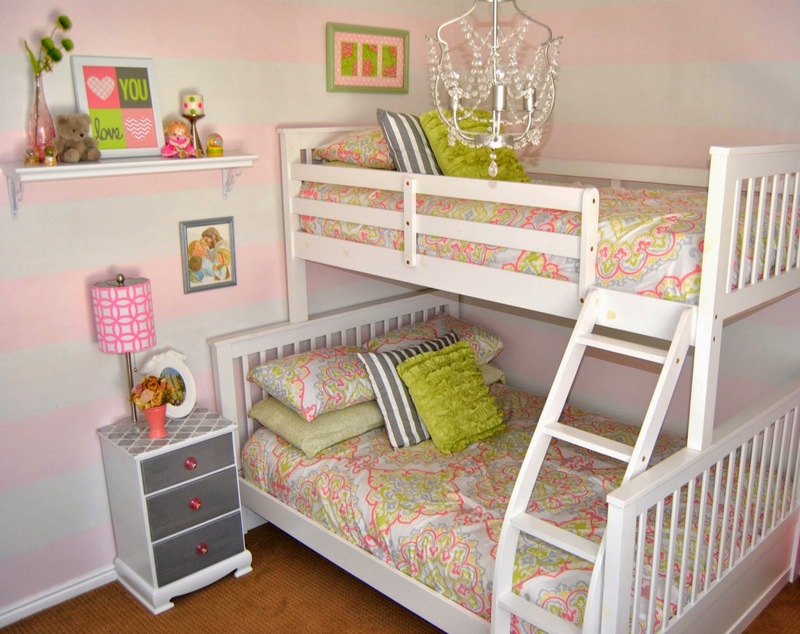 These two little sisters are my all time favorite clients, reason being... they are my own spunky little girls and designing this room was a dream! The number one reason why I loved doing this room so much more than their individual nurseries is because I know them now... 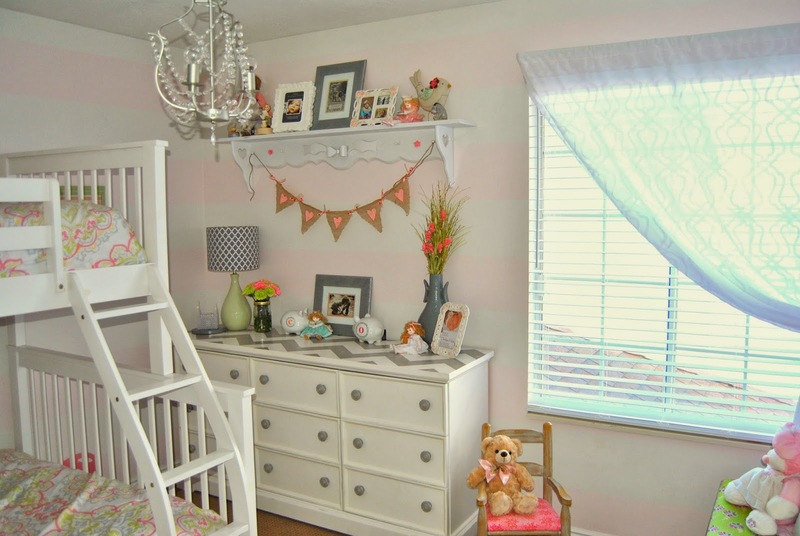 I decorated their other rooms while they were still in my womb, so I could only use my imagination and guess from what I could tell their personalities would be. :) The last 4 and a half years of motherhood has been pure heaven, so entirely blissful, and this feeling is what I wanted to create in their room. I think I nailed it on the head, and I am so happy with how it turned out, but I am even more thrilled with how much I see them loving and admiring their room. The starting point of the room was picking out this bed and bedding. I knew I wanted to get a white twin over full wooden bunk bed for them to share and I was so excited when I found the comforters at TJmaxx on super clearance and added a few pillows. II purchased this bunk bed from a local wholesale warehouse, but found this similar version on amazon for an even better price! After I decided on the color scheme, I decided on the wall treatment. 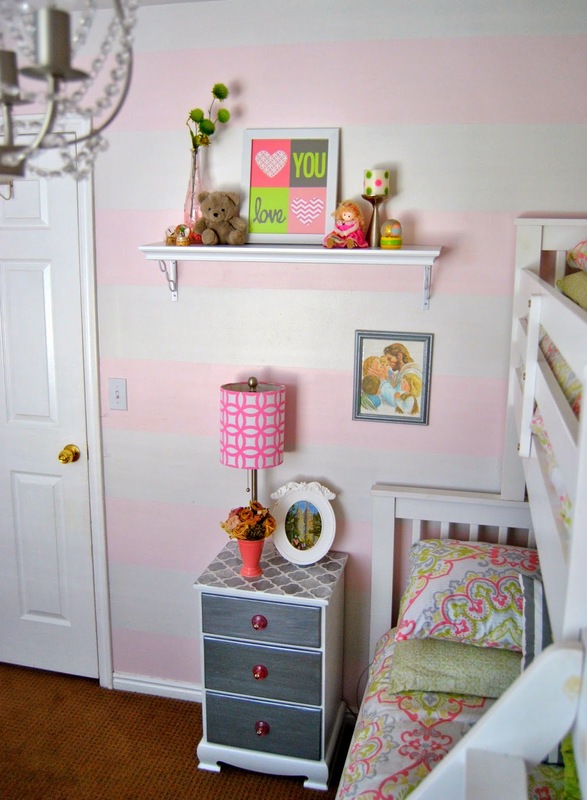 I wanted something super airy and light, and Olivia insisted on pink walls. So I went with 75% strength of Kwal's 'pink-a-boo' and made stripes with Kwal's 'washbasin'... Its VERY subtle, but I new I didn't want a saturated pink, so to me, this turned out perfectly. I found this little guy a few years back for Charly's nursery at a consignment shop for $30. 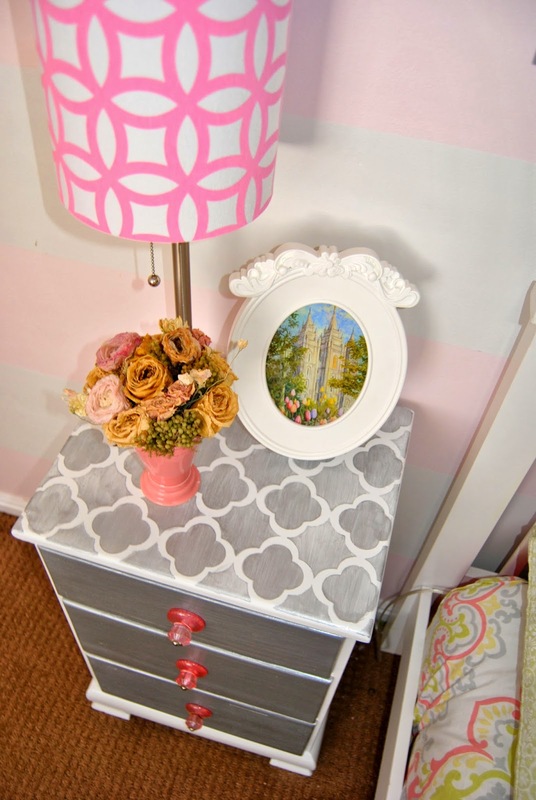 I painted it Rustoleum white and added a cute stencil on the top in a silvery gray. Similar quatrefoil stencil's can be purchased on etsy. I chose to put a shelf next to the top bunk per my 4 year olds request. She was a tad jealous her little sister had a place to put her night time water cup and thought she needed a spot for hers too. She was so excited and proud helping me hang her shelf. Home girl even knew what a level was. (proud momma moment right there!) These little items are a few of our keepsakes, this little teddy bear was actually the bear I took home from the hospital when I was a new born. I am so sentimental and I love seeing my childhood buddy displayed after all of these years. My sweet Grandfather made the girls this toybox for Christmas one year. 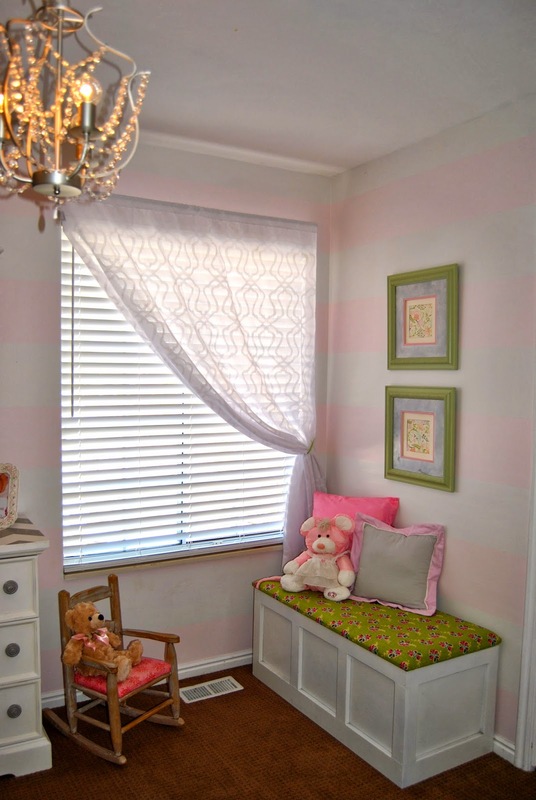 I am so happy to have been able to create such a sweet "window seat" area in their room. We love reading books here. 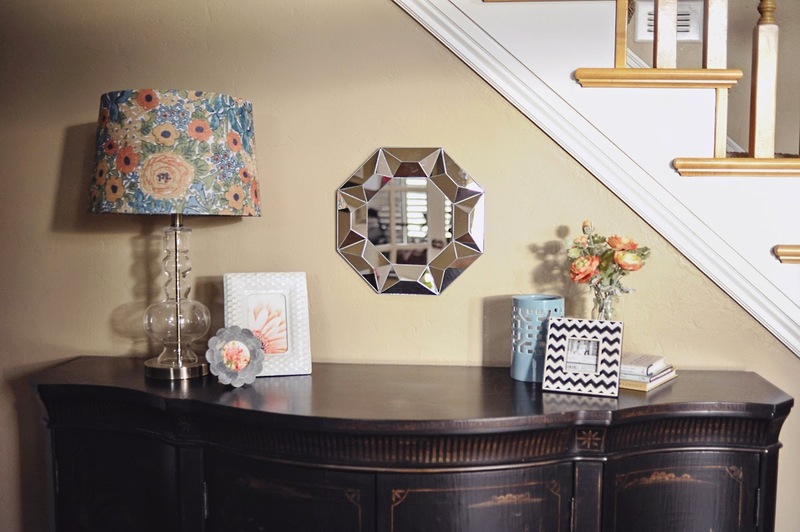 This delicious dresser was a lucky ksl classifieds find!!! It not only has 9 generous sized drawers, but the lady new what she was doing when she refinished this, and of course I adore the chevron top! 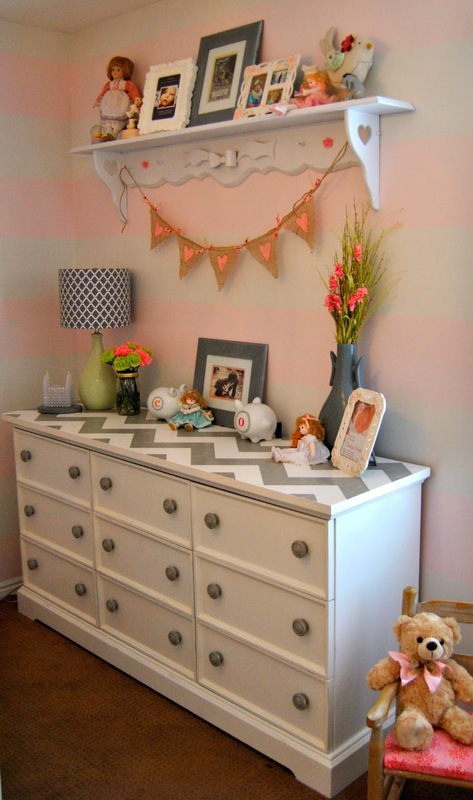 I love how all of the graphic prints came together in this room! 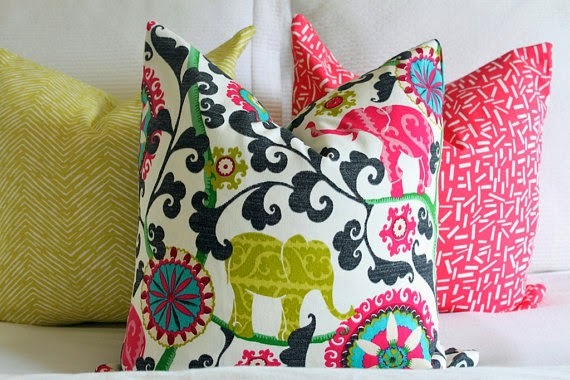 There is a lot going on in here, but the prints work together because they are a similar color. I sure love how this room came together and hope you enjoyed seeing a little bit into my home. Thanks for stopping by!